The globe-spanning presence of wheat and its exalted status among secular and sacred institutions alike differentiates this food from all others presently enjoyed by humans. Yet the unparalleled rise of wheat as the very catalyst for the emergence of ancient civilization has not occurred without a great price. 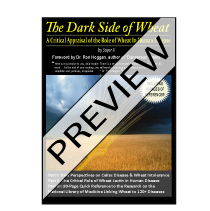 While wheat was the engine of civilization’s expansion and was glorified as a "necessary food," both in the physical (staff of life) and spiritual sense (the body of Christ), those suffering from celiac disease are living testimony to the lesser known dark side of wheat. A study of celiac disease and may help unlock the mystery of why modern man, who dines daily at the table of wheat, is the sickest animal yet to have arisen on this strange planet of ours. Celiac disease (CD) was once considered an extremely rare affliction, limited to individuals of European descent. Today, however, a growing number of studies indicate that celiac disease is found throughout the world at a rate of up to 1 in every 100 persons, which is several orders of magnitude higher than previously estimated. Despite common misconceptions, monogenic diseases, or diseases that result from errors in the nucleotide sequence of a single gene are exceedingly rare. Perhaps only 1% of all diseases fall within this category, and Celiac disease is not one of them. In fact, following the completion of the Human Genome Project (HGP) in 2003 it is no longer accurate to say that our genes "cause" disease, any more than it is accurate to say that DNA alone is sufficient to account for all the proteins in our body. Despite initial expectations, the HGP revealed that there are only 20,000-25,000 genes in human DNA (genome), rather than the 100,000 + believed necessary to encode the 100,000 + proteins found in the human body (proteome). The "blueprint" model of genetics: one gene → one protein → one cellular behavior, which was once the holy grail of biology, has now been supplanted by a model of the cell where epigenetic factors (literally: "beyond the control of the gene") are primary in determining how DNA will be interpreted, translated and expressed. A single gene can be used by the cell to express a multitude of proteins and it is not the DNA alone that determines how or what genes will be expressed. Rather, we must look to the epigenetic factors to understand what makes a liver cell different from a skin cell or brain cell. All of these cells share the exact same 3 billion base pairs that make up our genome, but it is the epigenetic factors, e.g. regulatory proteins and post-translational modifications, that make the determination as to which genes to turn on and which to silence, resulting in each cell’s unique phenotype. Moreover, epigenetic factors are directly and indirectly influenced by the presence or absence of key nutrients in the diet, as well as exposures to chemicals, pathogens and other environmental influences. Within the scope of this new perspective even classical monogenic diseases like cystic fibrosis (CF) can be viewed in a new, more promising light. In CF many of the adverse changes that result from the defective expression of the Cystic Fibrosis Transmembrane Conductance Regulator (CFTR) gene may be preventable or reversible, owing to the fact that the misfolding of the CFTR gene product has been shown to undergo partial or full correction (in the rodent model) when exposed to phytochemicals found in turmeric, cayenne, and soybean Moreover, nutritional deficiencies of seleniun, zinc, riboflavin, vitamin e, etc. in the womb or early in life, may "trigger" the faulty expression or folding patterns of the CFTR gene in cystic fibrosis which might otherwise have avoided epigenetic activation. This would explain why it is possible to live into one’s late seventies with this condition, as was the case for Katherine Shores (1925-2004). The implications of these findings are rather extraordinary: epigenetic and not genetic factors are primary in determining disease outcome. Even if we exclude the possibility of reversing certain monogenic diseases, the basic lesson from the post-Genomic era is that we can’t blame our DNA for causing disease. Rather, it may have more to do with what we choose to expose our DNA to. What all of this means for CD is that the genetic susceptibility locus, HLA-DQ, does not by itself determine the exact clinical outcome of the disease. Instead of being 'the cause,' the HLA genes may be activated as a consequence of the disease process. Thus, we may need to shift our epidemiological focus from viewing this as a classical "disease" involving a passive subject controlled by aberrant genes, to viewing it as an expression of a natural, protective response to the ingestion of something that the human body was not designed to consume. If we view celiac disease not as an unhealthy response to a healthy food, but as a healthy response to an unhealthy food, classical CD symptoms like diarrhea may make more sense. Diarrhea can be the body’s way to reduce the duration of exposure to a toxin or pathogen, and villous atrophy can be the body’s way of preventing the absorption and hence, the systemic effects of chronic exposure to wheat. People with celiac disease may actually have an advantage over the apparently non-afflicted because those who are "non-symptomatic" and whose wheat intolerance goes undiagnosed or misdiagnosed because they lack the classical symptoms and may suffer in ways that are equally or more damaging, but expressed more subtly, or in distant organs. Within this view celiac disease would be redefined as a protective (healthy?) response to exposure to an inappropriate substance, whereas "asymptomatic" ingestion of the grain with its concomitant "out of the intestine" and mostly silent symptoms, would be considered the unhealthy response insofar as it does not signal in an obvious and acute manner that there is a problem with consuming wheat. It is possible that celiac disease represents both an extreme reaction to a global, species-specific intolerance to wheat that we all share in varying degrees. CD symptoms may reflect the body’s innate intelligence when faced with the consumption of a substance that is inherently toxic. Let me illustrate this point using wheat germ agglutinin (WGA), as an example. WGA is classified as a lectin and is known to play a key role in kidney pathologies, such as IgA nephropathy. In the article: "Do dietary lectins cause disease?" the Allergist David L J Freed points out that WGA binds to "glomerular capillary walls, mesangial cells and tubules of human kidney and (in rodents) binds IgA and induces IgA mesangial deposits," indicating that wheat consumption may lead to kidney damage in susceptible individuals. Indeed, a study from the Mario Negri Institute for Pharmacological Research in Milan Italy published in 2007 in the International Journal of Cancer looked at bread consumption and the risk of kidney cancer. They found that those who consumed the most bread had a 94% higher risk of developing kidney cancer compared to those who consumed the least bread. Given the inherently toxic effect that WGA may have on kidney function, it is possible that in certain genetically predisposed individuals (e.g. HLA-DQ2/DQ8) the body – in its innate intelligence – makes an executive decision: either continue to allow damage to the kidneys (or possibly other organs) until kidney failure and rapid death result, or launch an autoimmune attack on the villi to prevent the absorption of the offending substance which results in a prolonged though relatively malnourished life. This is the explanation typically given for the body’s reflexive formation of mucous following exposure to certain highly allergenic or potentially toxic foods, e.g. dairy products, sugar, etc? The mucous coats the offending substance, preventing its absorption and facilitating safe elimination via the gastrointestinal tract. From this perspective the HLA-DQ locus of disease susceptibility in the celiac is not simply activated but utilized as a defensive adaptation to continual exposure to a harmful substance. In those who do not have the HLA-DQ locus, an autoimmune destruction of the villi will not occur as rapidly, and exposure to the universally toxic effects of WGA will likely go unabated until silent damage to distant organs leads to the diagnosis of a disease that is apparently unrelated to wheat consumption. Loss of kidney function may only be the "tip of the iceberg," when it comes to the possible adverse effects that wheat proteins and wheat lectin can generate in the body. If kidney cancer is a likely possibility, then other cancers may eventually be linked to wheat consumption as well. This correlation would fly in the face of globally sanctioned and reified assumptions about the inherent benefits of wheat consumption. It would require that we suspend cultural, socio-economic, political and even religious assumptions about its inherent benefits. 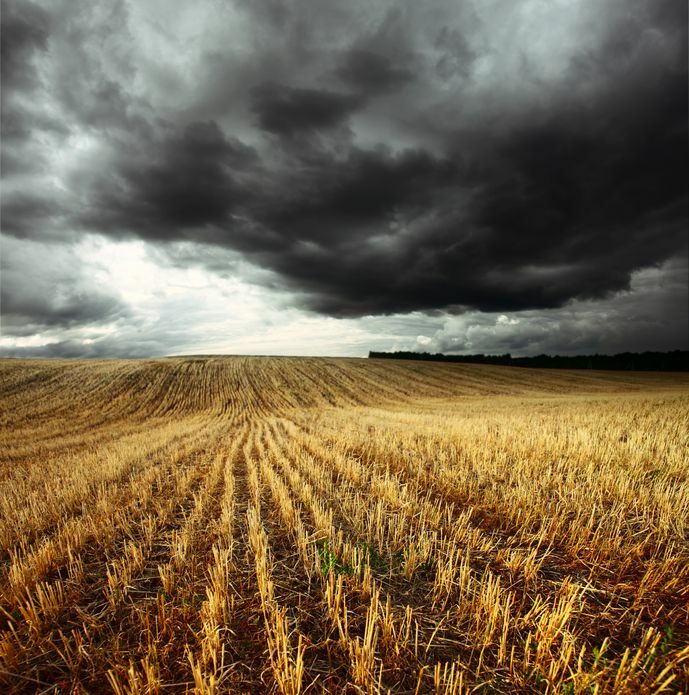 In many ways, the reassessment of the value of wheat as a food requires a William Boroughs-like moment of shocking clarity when we perceive "in a frozen moment….what is on the end of every fork." Let’s take a closer look at what is on the end of our forks. In a previous article, I discussed the role that wheat plays as an industrial adhesive (e.g. paints, paper mache’, and book binding-glue) in order to illustrate the point that it may not be such a good thing for us to eat. The problem is implicit in the word gluten, which literally means "glue" in Latin and in words like pastry and pasta, which derives from wheatpaste, the original concoction of wheat flour and water which made such good plaster in ancient times. What gives gluten its adhesive and difficult-to-digest qualities are the high levels of disulfide bonds it contains. These same sulfur-to-sulfur bonds are found in hair and vulcanized rubber products, which we all know are difficult to decompose and are responsible for the sulfurous odor they give off when burned. There will be 676 million metric tons of wheat produced this year alone, making it the primary cereal of temperate regions and third most prolific cereal grass on the planet. This global dominance of wheat is signified by the Food & Agricultural Organization’s (FAO) (the United Nation’s international agency for defeating hunger) use of a head of wheat as its official symbol. Any effort to indict the credibility of this "king of grains" will prove challenging. As Rudolf Hauschka once remarked, wheat is "a kind of earth-spanning organism." It has vast socio-economic, political, and cultural significance. For example, in the Catholic Church, a wafer made of wheat is considered irreplaceable as the embodiment of Christ. . It is this co-dependence that may explain why our culture has for so long consistently confined wheat intolerance to categorically distinct, "genetically-based" diseases like "celiac." These categorizations may protect us from the realization that wheat exerts a vast number of deleterious effects on human health in the same way that "lactose intolerance" distracts attention from the deeper problems associated with the casein protein found in cow’s milk. Rather than see wheat for what it very well may be: a biologically inappropriate food source, we "blame the victim," and look for genetic explanations for what’s wrong with small subgroups of our population who have the most obvious forms of intolerance to wheat consumption, e.g. celiac disease, dermatitis herpetiformis, etc. The medical justification for these classifications may be secondary to economic and cultural imperatives that require the inherent problems associated with wheat consumption be minimized or occluded. "Beef: Feeding wheat to ruminants requires some caution as it tends to be more apt than other cereal grains to cause acute indigestion in animals which are unadapted to it. The primary problem appears to be the high gluten content of which wheat in the rumen can result in a "pasty" consistency to the rumen contents and reduced rumen motility." Wheat presents a special case insofar as wild and selective breeding has produced variations which include up to 6 sets of chromosomes (3x the human genome worth!) capable of generating a massive number of proteins each with a distinct potentiality for antigenicity. Common bread wheat (Triticum aestivum), for instance, has over 23,788 proteins cataloged thus far. In fact, the genome for common bread wheat is actually 6.5 times larger than that of the human genome! Thankfully we don’t need to rely on our intuition, or even (not so) common sense to draw conclusions about the inherently unhealthy nature of wheat. A wide range of investigation has occurred over the past decade revealing the problem with the alcohol soluble protein component of wheat known as gliadin, the sugar-binding protein known as lectin (Wheat Germ Agglutinin), the exorphin known as gliadomorphin, and the excitotoxic potentials of high levels of aspartic and glutamic acid found in wheat. Add to these the anti-nutrients found in grains such as phytates, enzyme inhibitors, etc. and you have a substance which we may more appropriately consider the farthest thing from wholesome. "The data obtained in this pilot study supports the hypothesis that gluten elicits its harmful effect, throughout an IL15 innate immune response, on all individuals [my italics]." The primary difference between the two groups is that the celiac disease patients experienced both an innate and an adaptive immune response to the gliadin, whereas the non-celiacs experienced only the innate response. The researchers hypothesized that the difference between the two groups may be attributable to greater genetic susceptibility at the HLA-DQ locus for triggering an adaptive immune response, higher levels of immune mediators or receptors, or perhaps greater permeability in the celiac intestine. It is possible that over and above the possibility of greater genetic susceptibility, most of the differences are from epigenetic factors that are influenced by the presence or absence of certain nutrients in the diet. Other factors such as exposure to NSAIDs like naproxen or aspirin can profoundly increase intestinal permeability in the non-celiac, rendering them susceptible to gliadin’s potential for activating secondary adaptive immune responses. This may explain why in up to 5% of all cases of classically defined celiac disease the typical HLA-DQ haplotypes are not found. However, determining the factors associated greater or lesser degrees of susceptibility to gliadin’s intrinsically toxic effect should be a secondary to the fact that it is has been demonstrated to be toxic to both non-celiacs and celiacs. Gliadin upregulates the production of a protein known as zonulin, which modulates intestinal permeability. Over-expression of zonulin is involved in a number of autoimmune disorders, including celiac disease and Type 1 diabetes. Researchers have studied the effect of gliadin on increased zonulin production and subsequent gut permeability in both celiac and non-celiac intestines, and have found that "gliadin activates zonulin signaling irrespective of the genetic expression of autoimmunity, leading to increased intestinal permeability to macromolecules. "10 These results indicate, once again, that a pathological response to wheat gluten is a normal or human, species specific response, and is not based entirely on genetic susceptibilities. Because intestinal permeability is associated with wide range of disease states, including cardiovascular illness, liver disease and many autoimmune disorders, I believe this research indicates that gliadin (and therefore wheat) should be avoided as a matter of principle. 4) WHEAT LECTIN (WGA) DAMAGES OUR TISSUE. There is evidence that WGA may cause increased shedding of the intestinal brush border membrane, reduction in surface area, acceleration of cell losses and shortening of villi, via binding to the surface of the villi. WGA can mimic the effects of epidermal growth factor (EGF) at the cellular level, indicating that the crypt hyperplasia seen in celiac disease may be due to a mitogenic reponse induced by WGA. WGA has been implicated in obesity and "leptin resistance" by blocking the receptor in the hypothalamus for the appetite satiating hormone leptin. WGA has also been shown to have an insulin-mimetic action, potentially contributing to weight gain and insulin resistance.15 And, as discussed earlier, wheat lectin has been shown to induce IgA mediated damage to the kidney, indicating that nephropathy and kidney cancer may be associated with wheat consumption. Click here to read a sample of this document.